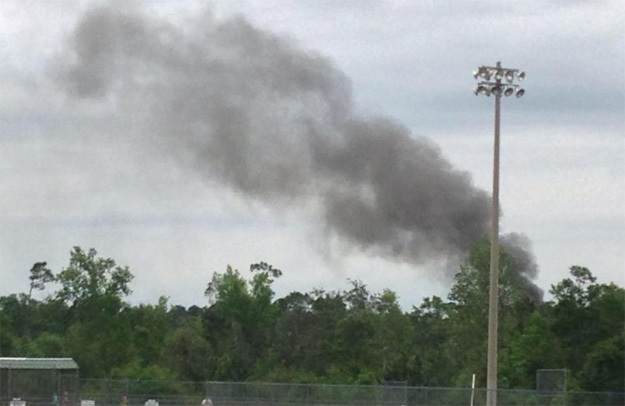 [Updated] Several fire stations responded to a shed fire in Cantonment early Tuesday evening, sending black smoke into the sky that was visible for miles. The fire was reported about 6:15 in the 400 block of Well Line Road, near the corner of Lakeview Avenue. The shed, about 400 square feet in size, was completely destroyed in the fire. The blaze is under investigation by the Florida State Fire Marshal’s Office. Editor’s note: An earlier version of this story stated “The first fire units on scene reported the shed was behind a locked gate and a citizen would not allow firefighters on the property.” While that was the report from the first fire units on scene, the fire unit’s report was based upon incomplete information. Fire officials confirmed Wednesday morning that they were allowed access to the property. Pictured top: Black smoke from a fire Tuesday evening on Well Line Road was visible from the Cantonment Ballpark. Submitted photo for NorthEscambia.com, click to enlarge. 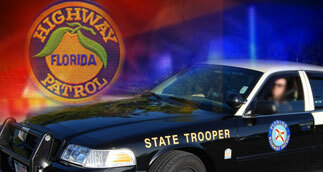 An Escambia County man died in a traffic crash Monday night on I-10 in Santa Rosa County. The Florida Highway Patrol said a semi-tractor trailer was stopped in the outside eastbound lane of I-10 after being involved in a prior crash. The driver of the semi had placed emergency reflectors in the roadway and had activated his emergency flashers on the truck and trailer to warn motorists. Daniel Mac Dobbins, age 34 of Pensacola, was eastbound on I-10 at the 34 mile marker when he failed to see the semi, traveling over the reflectors and into the rear of the trailer being pulled by the semi. Dobbins’ 2006 VW Passat came to rest under the trailer. He was pronounced deceased at the scene. The crash was not alcohol related, according to the FHP. A Flomaton woman has been sentenced in connection with a cutting that occurred in Century in late August 2012. Chelesa Dianne Boutwell, now 20, was charged with aggravated battery with a deadly weapon following the early morning incident in the area of Pond and Ramar streets. The Escambia County Sheriff’s Office responded to Jay Hospital after receiving a report of a cutting victim. They discovered 21-year old Hannah Joyce Campbell of Century had 8-10 cuts to her face and hand from an unknown sharp object, according to an arrest report. 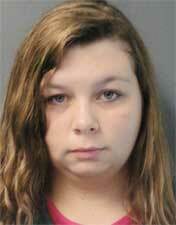 Campbell was transferred to a Pensacola hospital for further treatment for her injuries. Boutwell told deputies that she had been having problems with Campbell for about a week. The pair became involved in a physical altercation, and Boutwell admitted to hitting Campbell several times. Boutwell said when she noticed that Campell was bleeding, she stopped and helped her up off the ground, the arrest report stated. Boutwell told deputies she did not know how Campbell was cut, but believed the injuries may have been caused by a ring on her finger. Boutwell pleaded not contest to the charges against her. Judge Ross Goodman withheld adjudication and sentenced Boutwell to a suspended 36 months in state prison and placed her on probation for 36 months. She was also ordered to stay away from Campbell, pay a restitution amount to be determined and attend anger management counseling. A Cantonment insurance agent has been arrested on several felony charges for allegedly selling hundreds of fraudulent life insurance policies through a fake employment company. Randall Petersen, 47, was charged with insurance fraud, grand theft and criminal use of personal identification. Investigators contend that Petersen created a fictitious employment company to lure individuals into applying for fraudulent life insurance policies earning him more than $330,000 in bonuses and commissions, according to Florida Department of Financial Services and CFO Jeff Atwater. An investigation by the Department of Financial Services, Division of Insurance Fraud, revealed that Petersen created a shell company using the business name of College Consultants of the Gulf Coast to lure individuals into attending employment seminars throughout the southeastern United States including Florida, Georgia and Mississippi. Petersen placed an estimated 285 fictitious life insurance policies with American National Insurance Company, which paid him bonuses and commissions of more than $330,000. American National informed the department of the suspected fraud once the policies started canceling for nonpayment. Petersen was booked into the Escambia County Jail. If convicted, he faces up to 30 years in prison. Pending the outcome of the criminal investigation, administrative action may be taken against his insurance license. 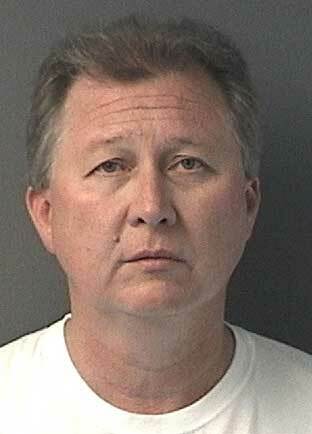 Petersen was released from the Escambia County Jail on a $30,000 bond. 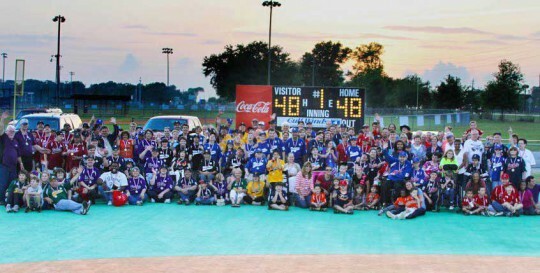 Five-time NASCAR Sprint Cup Series champion Jimmie Johnson has selected the Miracle League of Pensacola to be featured on the 2013 Jimmie Johnson Foundation Blue Bunny Helmet of Hope. The Miracle League will receive $10,000 and will appear on the helmet Johnson will wear during race weekend activities at Michigan International Speedway in Brooklyn on August 18. The Miracle League of Pensacola provides a safe, organized baseball league and facilities for Gulf Coast children with mental and/or physical challenges where every player plays, every player hits, every player gets on base, every player scores and every player wins – every inning. Currently they serve nearly 200 players ranging in age from 4 to 64 years young. The League pairs up an able bodied person with each player, enabling the people of the community to form a bond with the players and also to see the happiness that the players gain by being able to play the game of baseball. “We are honored to be recognized and will continue to provide a safe and organized baseball league for the Gulf Coast,” Shirley Godwin of the Miracle League said. Pictured top: Miracle League of Pensacola players, coaches and volunteers offer a special “thanks” to Jimmie Johnson, driver of the No. 48 Lowe’s Chevrolet for Nascar, after their selection to appear on the Jimmie Johnson Foundation Blue Bunny Helmet of Hope and a $10,000 grant. Submitted photo for NorthEscambia.com, click to enlarge. West Florida Public Library has been awarded a grant by the Gilder Lehman Institute of American History to host Civil War programs and scholar‐led discussions. There will be various events for persons of all ages taking place at most library branches during the month of May. To begin the program, Dave Ehlert, skilled Civil War history performer from Branson, Missouri, will be at the West Florida Genealogy Library, located on the PSC Main Campus at 5:30 pm Wednesday, May 1st. He will portray Lincoln and Twain with historical drama, humor and education in a live production of “Abe Lincoln, Mark Twain & the Civil War.” Light refreshments will be served. On Thursdays at 5:30, May 2 and May 30th at Southwest and Main libraries respectively, Price Legg will share reenactment history of a civil war soldier. Phil Duryea, volunteer coordinator for the National Naval Aviation Museum, will share artifacts of Civil War memorabilia and authentic maps of the era. Both programs are for families with children ages 7 and older. Woody Barnes will share his wealth of genealogical knowledge in his presentation “War Between the States Military Records”. He is a member of the Jamestown Society, Society of the War of 1812, Sons of the American Revolution (SAR) and Sons of Confederate Veterans (SCV). Participants are encouraged to bring their own family history notes and utilize the library’s computers for online genealogical research after the program. He will appear at the Molino Branch Library on May 9 at 6:30 p.m. and the Main Library at 5:30 p.m. on May 23. Programs for children will include activities ranging from how to write with a quill pen to the questionably tasty experience of hardtack. Program days and times are Main Library on Wednesday, May 15 at 4 p.m., at Tryon Library on Thursday, May 16 at 4 p.m. , at Westside Library on Saturday, May 18 at 2 p.m. , and at the Molino Library on Monday, May 20 at 4 p.m. The Civil War 150 Grant is in commemoration of the 150th anniversary of the American Civil War made possible by the Gilder Lehrman Institute of American History in partnership with The Library of America and the National Endowment for the Humanities. 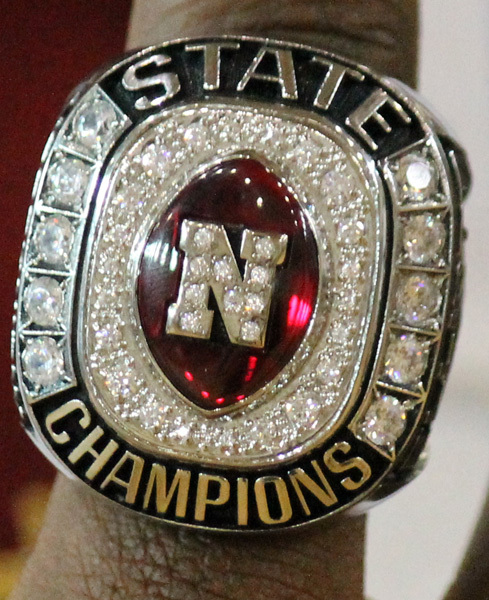 The Northview High School Chiefs received their state championship rings during a ceremony at the school Monday afternoon. Last December, the Chiefs won the District 1A State Football Championship in Orlando’s Citrus Bowl. It was the first state championship for the school in Bratt, and the only state football championship in Escambia County this year. Thomas presented a $1,000 donation toward the cost of the rings. Escambia County Commissioner Steven Barry, along with Century Mayor Freddie McCall and Eli and Sarah Miller, presented another combined $1,000 donation. While every player received their ring Monday, the full bill is not yet paid. Donations are being accepted at the school to provide the rings to students in need. Also Monday, members of the varsity cheerleading squad were presented with their State Championship Medallions. Pictured top: Northview Chiefs Kahlil Grice, Ryan Lambert and Justin Halteman react upon seeing their state championship rings for the first time Monday afternoon. Pictured below: The District 1A State Champion Northview Chiefs. NorthEscambia.com photos, click to enlarge. All 2012 unpaid real estate and tangible personal property taxes must be paid and receipted by close of business today to avoid being advertised as delinquent, according to Escambia County Tax Collector Janet Holley. As of last week, over $20 million in property taxes (about 8 percent) remained unpaid. The list of delinquent tax accounts will be published in a legal ad and posted on the tax collector’s website on May 9. Left in any of the 24-hour drop boxes available at all offices by midnight April 30. All late payments will be returned for additional fees. For more information, or to pay online, visit www.escambiataxcollector.com. The House rejected an amendment on Monday that would have required firefighters to watch their body mass index if they wanted to keep their job. In a voice vote, the House rejected the amendment that would have required all firefighters to keep their BMI at 25 or under. Rep. Janet Adkins, R-Fernandina Beach, proposed firefighters have their BMI tested every four years as an additional requirement to existing physical agility testing. “Right now we’ve got firefighters who are physically fit, with a BMI of 25 or less, that are being asked to do above and beyond the work of those who are not able to do it,” Adkins said. But a number of representatives expressed concern about the BMI rating system because it doesn’t calculate fitness of individuals, and can be misleading, particularly with highly muscular people. BMI divides an individual’s weight in pounds by height in inches squared and then multiplied by 703. A rating below 18.5 is deemed underweight, from 25 to 29.9 is considered overweight. A 5-foot, 9-inch person is considered overweight when weighing between 169 pounds and 202 pounds. The amendment was proposed for a measure that refines the duties of the State Fire Marshal, and among other changes would make it a felony to impersonate a volunteer firefighter. No final vote was taken on the underlying bill; that is expected on Tuesday. Foul play is suspected in the death of an Atmore man. 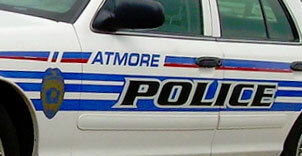 At 6:17 Sunday morning, Atmore Police responded to a reported unconscious person in the 80 block of Brooks Lane. As officers arrived, they observed a man later identified as 50-year old Marvin D. Norman of Atmore, on the ground in a yard. Police said he had injuries consistent with an assault. Norman was transported by Atmore Ambulance to Atmore Community Hospital. He was later airlifted by LifeFlight to Baptist Hospital in Pensacola where he passed away a short time later. Investigators said an autopsy will be performed to determine the cause of death. The Atmore Police Department is asking for anyone with information on Norman’s death to call them at (251) 368-9141.